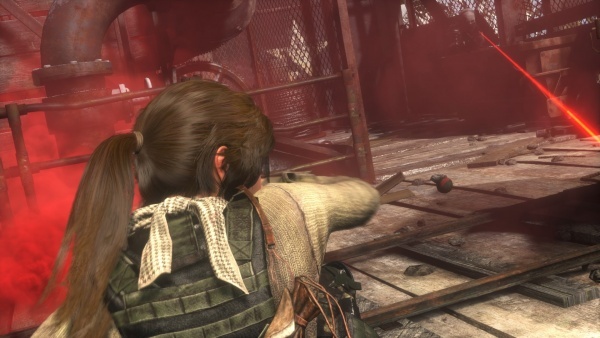 Lara finds a Nagant M1910 revolver in the Train Yard level. 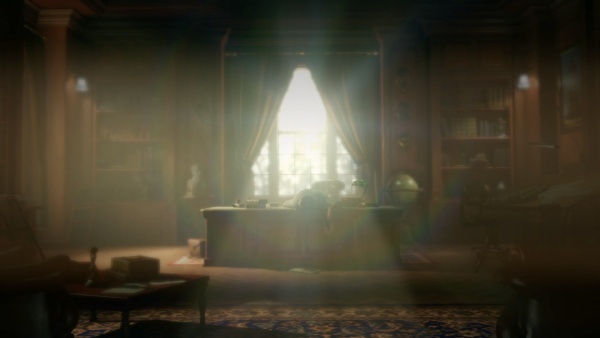 Concept art shows it as break-action, though in the final game it has a correct swing-out cylinder. Oddly, it also retain the non-working front hinge of a Smith & Wesson break-action revolver, from early version. Nadia, a NPC appearing in the Baba Yaga DLC, draws her Nagant on Lara after being found hiding in a locker. 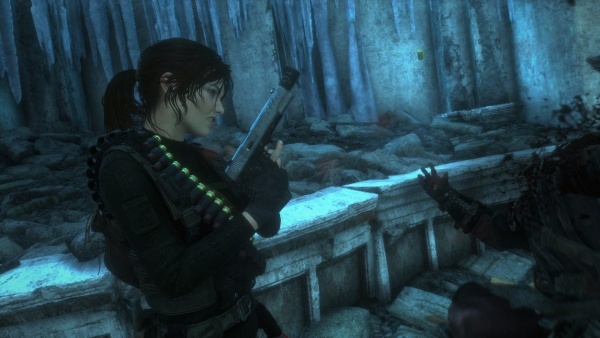 Lara quickly points out that the revolver is empty, and Nadia admits that the firing pin is broken anyways. It can be upgraded with a speed loader for faster reloads. 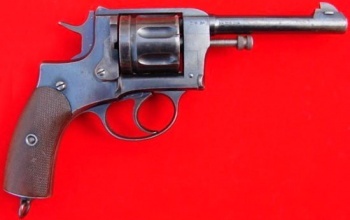 Nagant M1910 swing out cylinder Revolver - 7.62x38R Nagant. 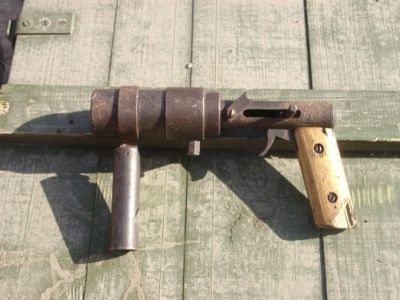 This version was made at Liege as a replacement for the M1895. But it was never introduced in mass production. 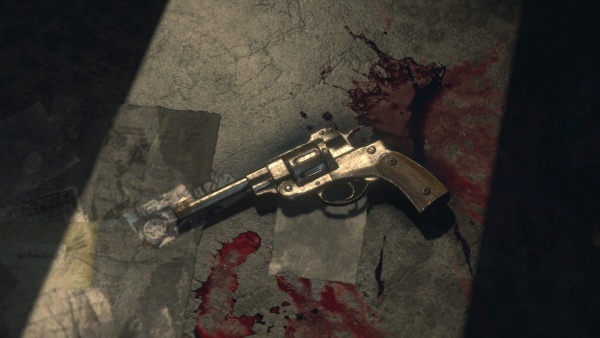 The mutant Nagant revolver lying on the ground. Oddly enough, the ejector rod is missing, but there has a useless hinge. Lara holds her newly acquired Nagant revolver. 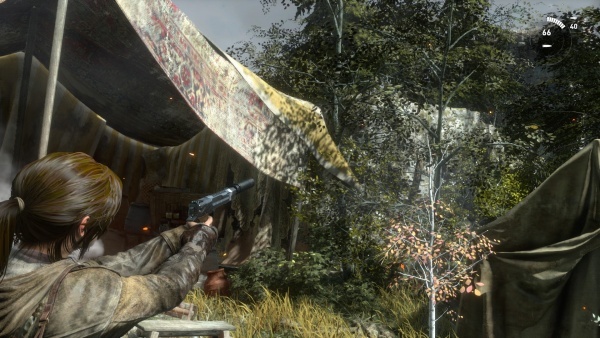 Lara aims the Nagant as she rides a lift in the Baba Yaga DLC mission. Note the permanently attached Pistol Suppressor. 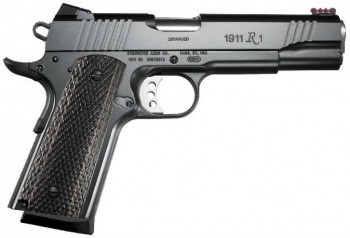 The Remington Model 1911 R1 Enhanced pistol is used by both Lara Croft and Trinity soldiers as the "Semi-Auto Pistol". A special version with a matte black finish, the "Acciptor Noxa", is available with the Siberian Ranger DLC. 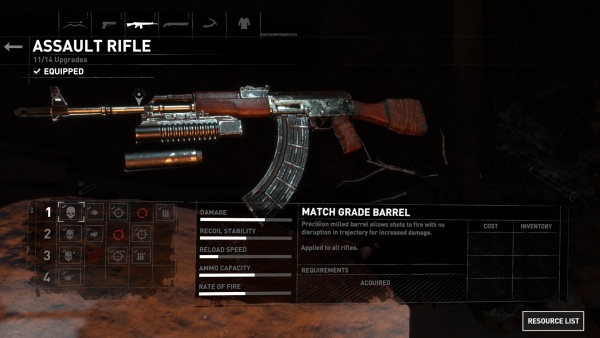 While in Syria and during QTEs the weapon has unlimited spare ammo, though in normal play it requires Lara to find ammunition. 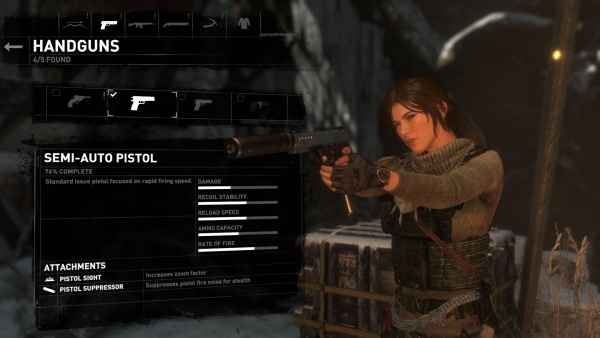 Unlocking the Hollow Point skill allows Lara to craft hollow-point rounds for increased damage. The stock 7 round magazine can be extended to 10, 14, and finally ??? rounds. Fired with Mouse Button 4, the HP rounds can be fired without reloading, resulting in Lara firing over 83 rounds (75 HP + 7 round base mag size) without reloading! 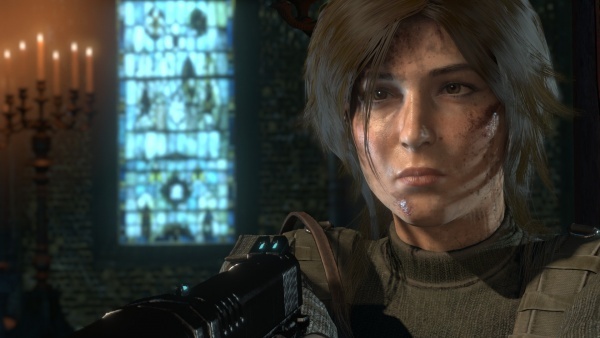 Lara stands down and holds her R1 Enhanced up to defuse the situation. It seems to be fitted with an original M1911A1 frame, also it has the newer 3 hole trigger clipping into the short A1 trigger. 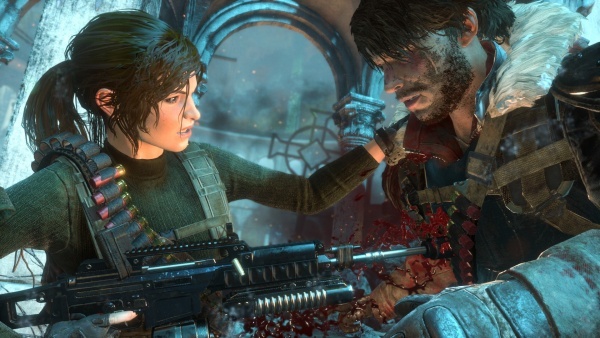 When the situation deteriorates, Lara opens fire. Note the infinity symbol showing infinite spare ammo. 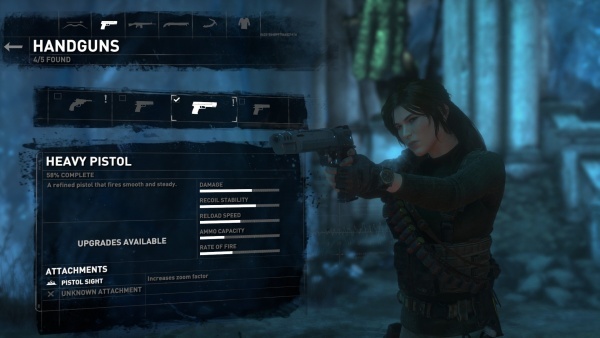 Lara holds her R1, fitted with an extended magazine, ported vented slide, and a suppressor in the weapons selection menu. The point of using a suppressor with a ported barrel is questionable. The Trinity soldier at the right holds his R1 Enhanced on captured Remnant fighters. 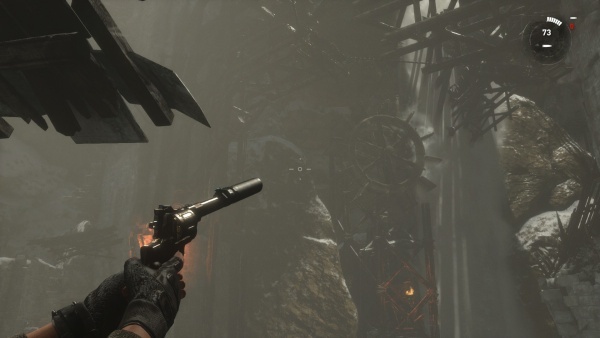 Lara holds her R1, fitted with a muzzle brake, as she executes a Trinity soldier with a Pistol Finisher attack. 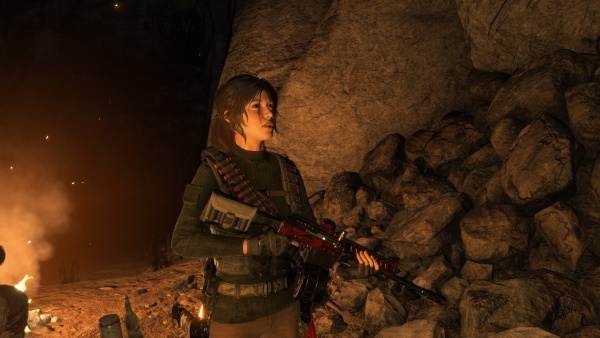 In the aftermath of another Pistol Finisher, Lara holds her R1, now fitted with an extended magazine and a Heckler & Koch USP Match's muzzle weight. 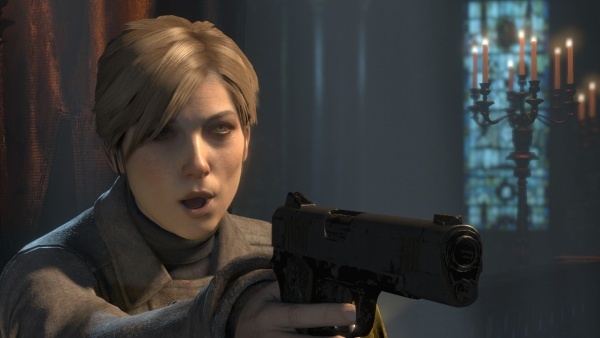 Anna aims a stock R1 at Lara in the game's climax. 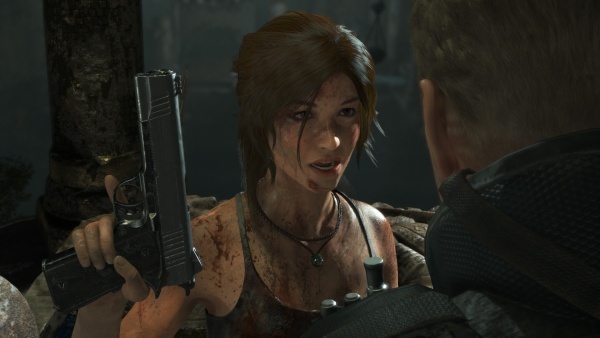 Lara holds her own pistol, the Accipitor Noxa, on Anna in the same cutscene. 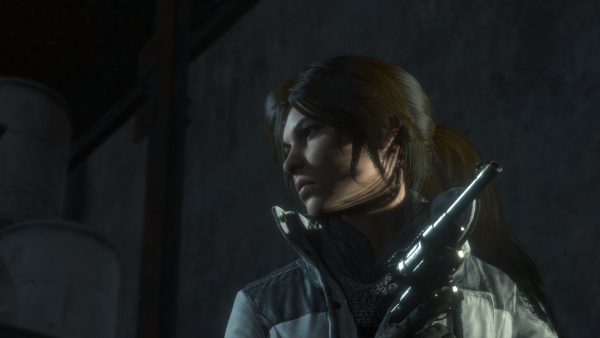 Lara aims her USP Match muzzle weight equipped R1 Enhanced in the final cutscene. 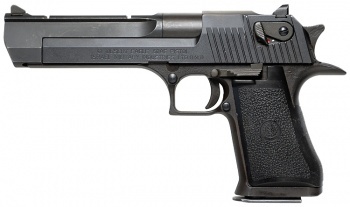 The "Heavy Pistol" is roughly based on the Desert Eagle Mark XIX. The Desert Eagle in the mods menu equipped with a muzzle brake and extended magazine. The model appears rather low-quality and shiny. 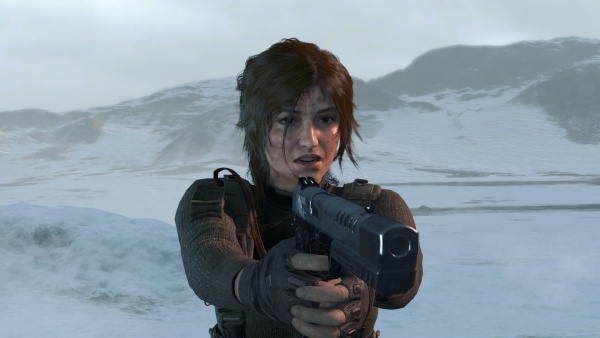 Lara holds the suppressed Desert Eagle. 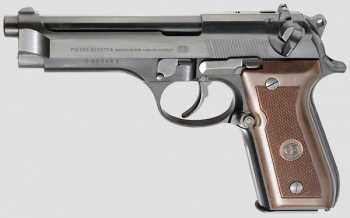 The Beretta 92SB is used by Lord Croft in a flashback to commit suicide. The model appears to have been recycled from the 2013 game. 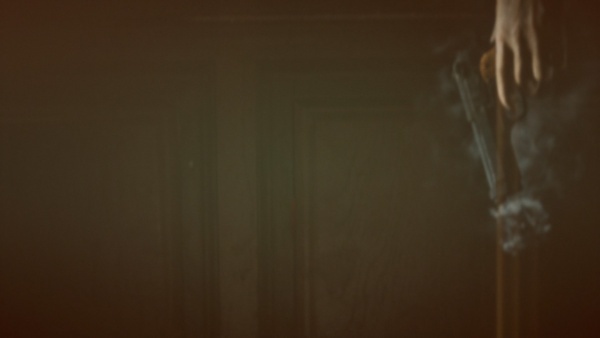 The smoking Beretta 92SB in Lord Croft's hand. 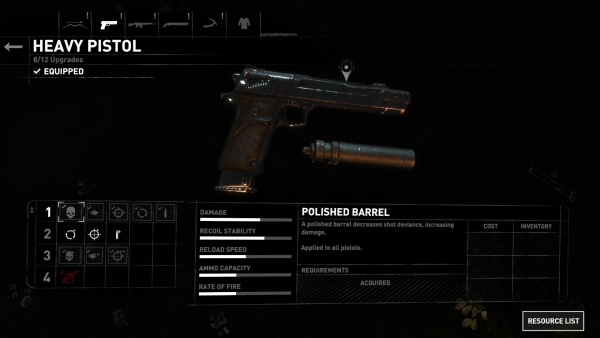 The Heckler & Koch USP Match appears as the weapon icon for the Desert Eagle, presumably in reference to Lara's preferred weapon in the original post-2001 continuity. 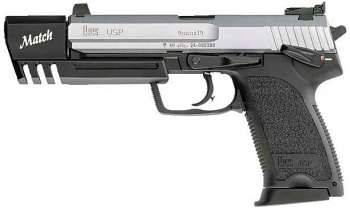 The USP Match appears as the weapon icon for the Desert Eagle. 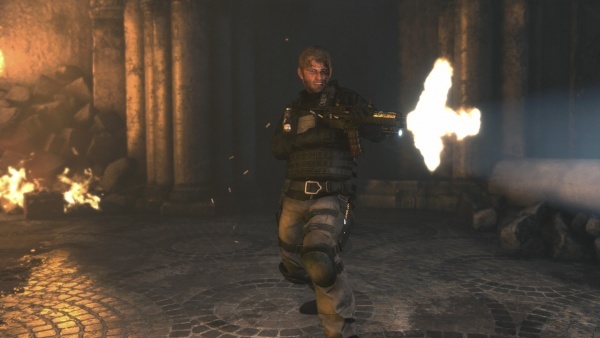 A modified Heckler & Koch MP7, based on the 2nd Heckler & Koch PDW prototype, appears as the "Submachine gun", a high rate of fire, low damage weapon available after Lara finds all 4 parts for it. For some reason, the grip is slanted rather that straight. The foregrip is always folded up and a unusable dot sight is mounted. 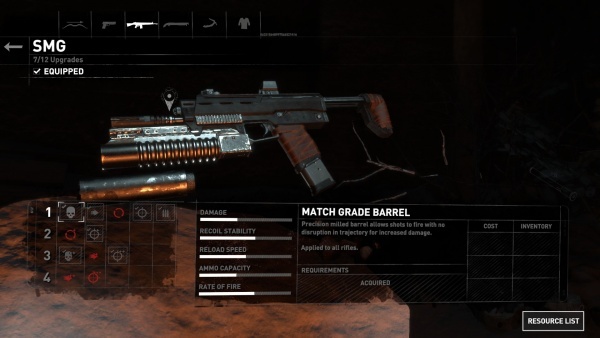 A heavily upgraded MP7 prototype in the upgrade menu. Note the slanted grip and mounted M203A1 grenade launcher clipping into the folded foregrip. 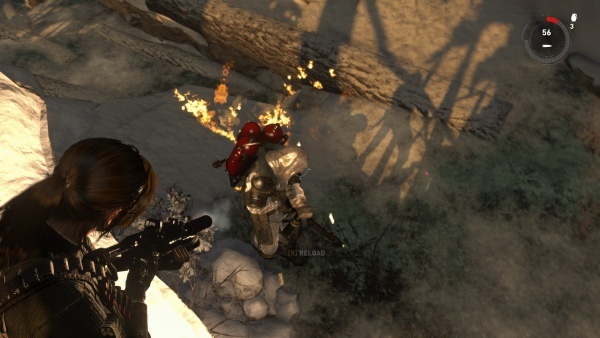 Brass flies as Lara opens fire on a Trinity flamethrower operator. 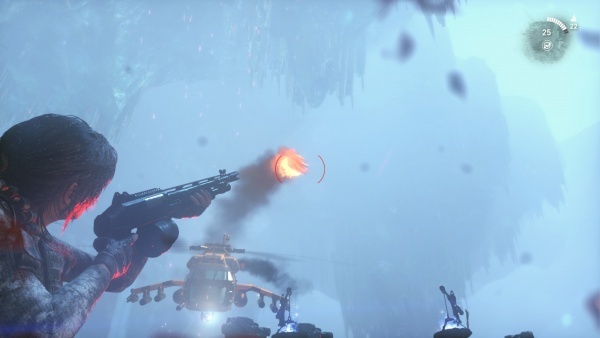 When Lara first enters the Geothermal Valley level, Remnant fighters are seen with Type 100 submachine guns fitted with home-made grenade launchers during a cutscene. 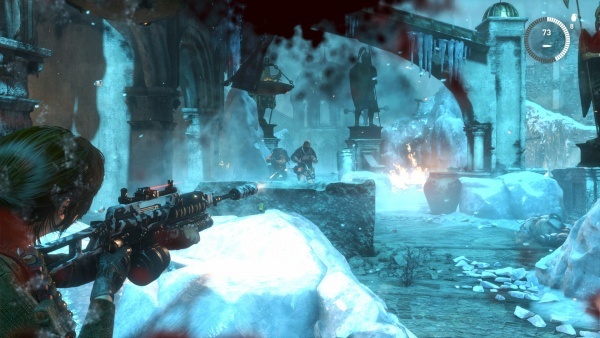 The Type 100 is seen again in the hands of Trinity soldiers as they advance to the Chamber of Souls. 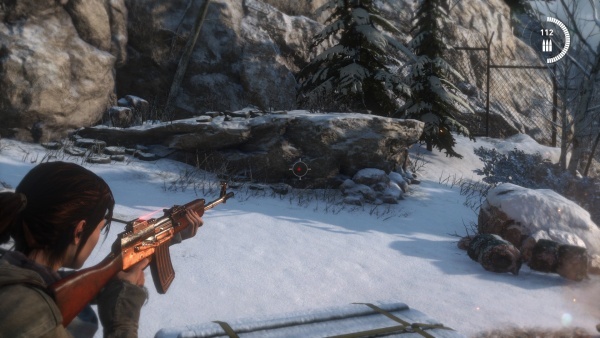 The model is recycled from the previous game, and the weapons are never seen again, with both factions using the WASR-2 in-game. 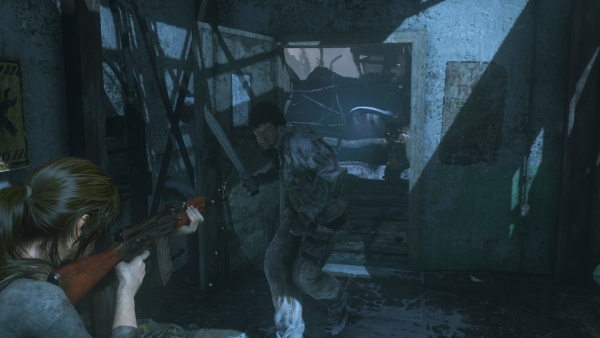 A Remnant fighter holds his Type 100 as Jacob appears. Another view of the same weapon. 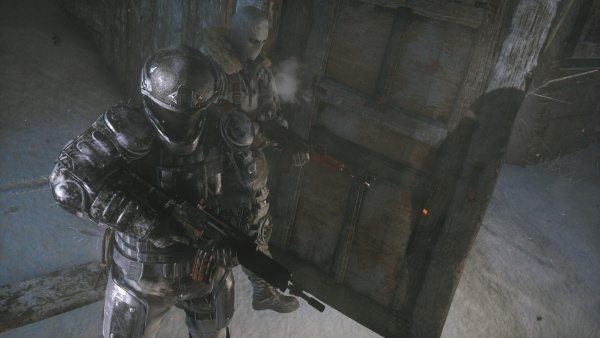 Trinity PMCs cover the rear as Anna heads for the Chamber of Souls, it appears that all of the Trinity operatives have the Type 100 in this cutscene. 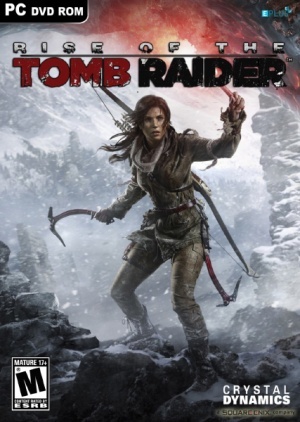 Lara acquires a Winchester Model 1912 shotgun during a battle in the Geothermal Valley's Upper Village after Jacob disarms a Trinity soldier of it and tosses it to her. Initially a stockless Trench version, the bayonet lug and heat shield disappear after Lara gets the weapon. 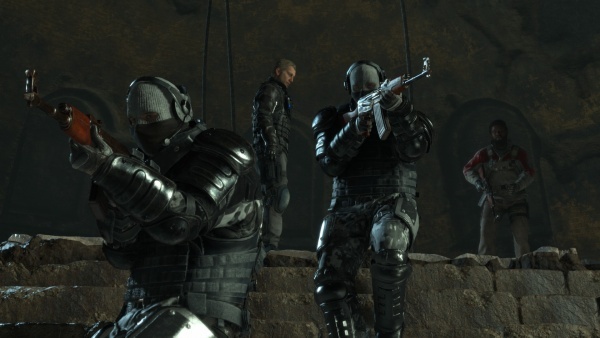 Trinity Breacher-type mercenaries use the cutscene Trench version late game as well. 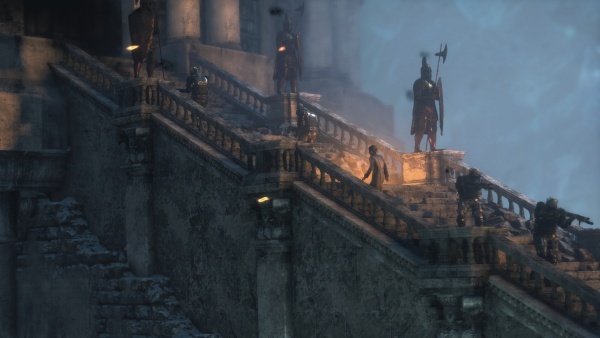 The model used by NPCs is recycled from the previous game as where Lara's is a new model made for the game. A Trinity soldier holds his Winchester Model 1912 on Jacob in the Upper Village. 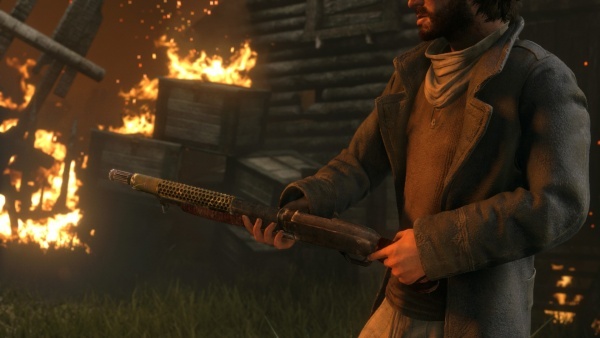 Note the bayonet lub and heat shield, also that it is the same model from the previous game. Jacob holds the Winchester Model 1912 after killing its former owner. 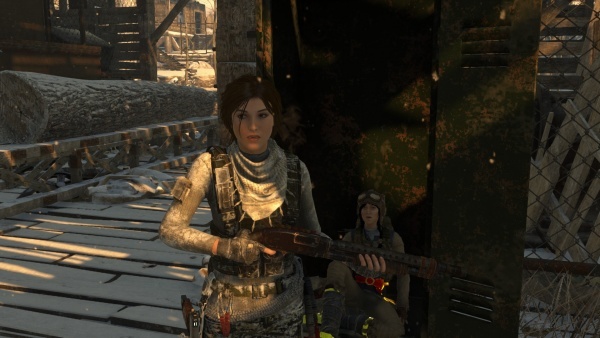 Lara holds her newly acquired Winchester Model 1912. The heat shield, bayonet lug, and green paint job are gone, though she can later add the heat shield as an upgrade. This is a new higher quality model made for this game. Lara holds her Model 1912, fitted with a shell holder and heat shield, as she talks with Nadia. 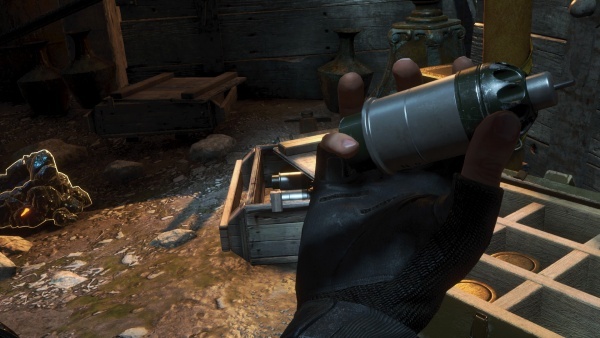 The shell holder is an inventory, rather than weapon, upgrade that increases Lara's shotshell ammo pool. 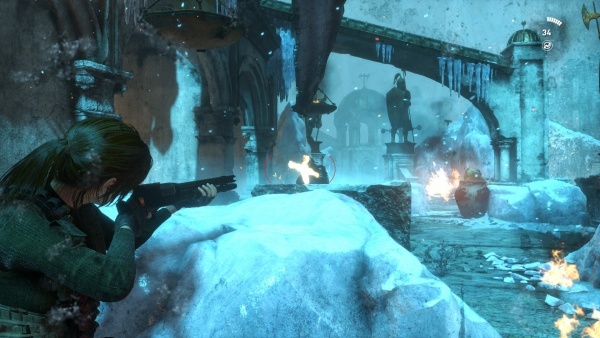 Lara holds the 1912 as she executes a Shotgun Finisher move on a Trinity soldier. 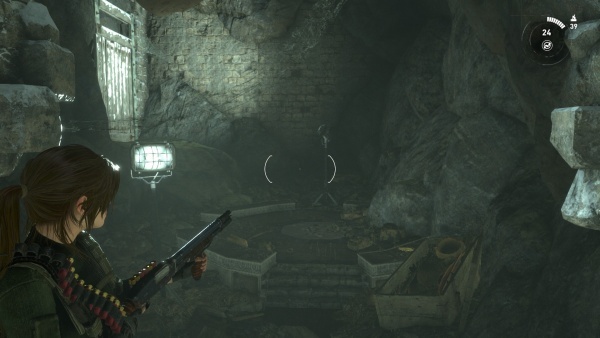 The Winchester can also be fitted with a pistol-grip forend for better control, as seen here as Lara heads out of the Red Mine Challenge Tomb. The small "39" by the ammo count is the number of incendiary Dragon's Breath shells Lara has available. 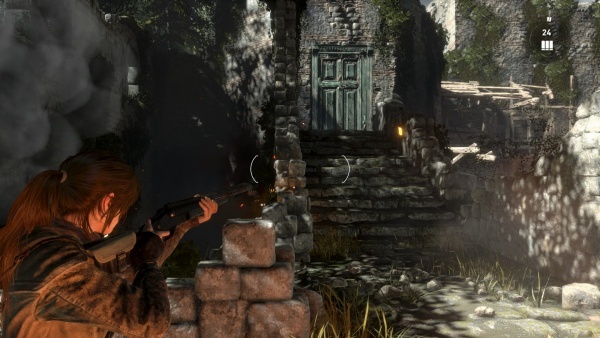 Lara aims her Model 1912, now fitted with a improved choke tube and extended magazine tube, as she battle her way through Trinity soldiers. A Trinity Breacher holds his Model 1912 Trench gun. The previous game's model again. 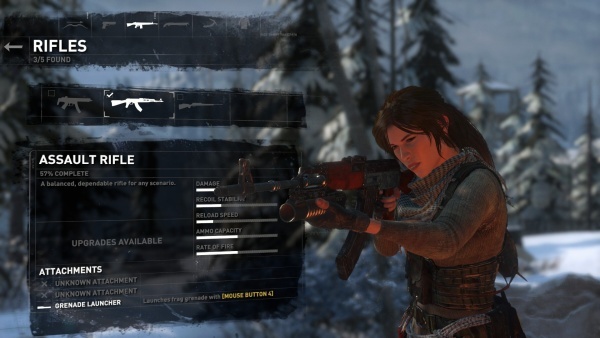 A 12 Gauge Double Barreled Shotgun is available as the "Break-Action Shotgun" after Lara finds the parts for it. 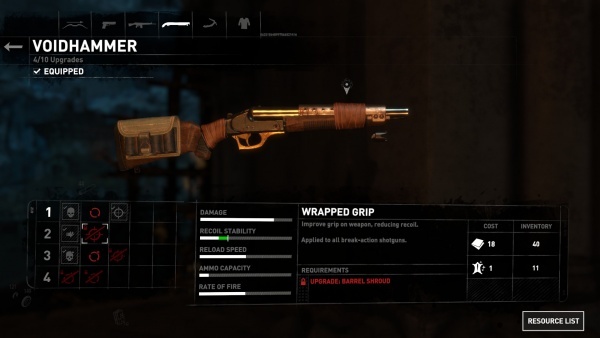 While powerful, its usefulness is diminished by being the third shotgun available, as the Tactical Shotgun can be bought early game and the Pump Shotgun is acquired before all the Break-action's parts are found. 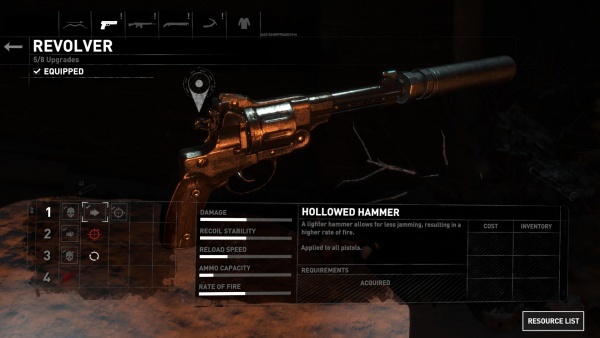 An even more powerful Gold version, Thunderclap, is awarded for achieving 100% completion and a short-barrel version, Voidhammer, is available with the Cold Darkness DLC. J.P. Sauer Shotgun - 12 gauge. 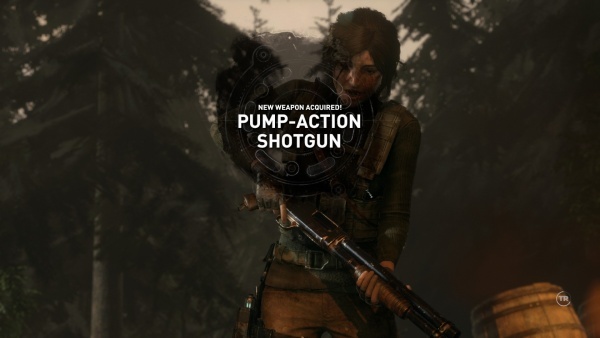 Lara aims her newly acquired double-barreled shotgun, fitted with a heat shield and shell holder. 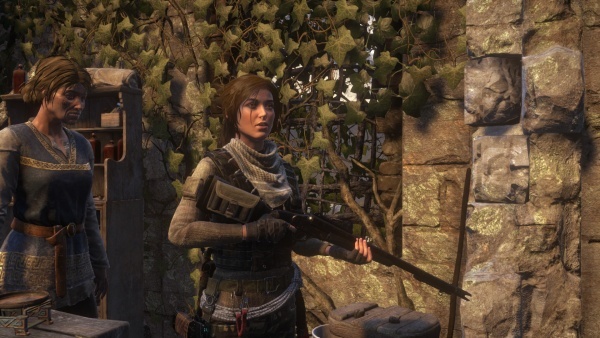 A nice view of the double-barreled shotgun as Lara talks to one of the Remnant. Note the improved choke fitted to the muzzle. Lara puts her shotgun to good use and murders Bambi. 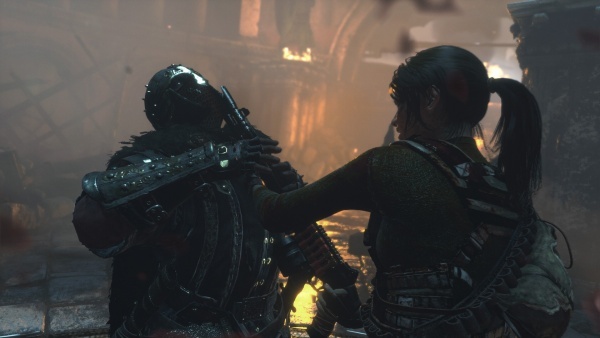 Lara guns down an Infected as she escapes an exploding lair in the Final Darkness DLC mission. Voidhammer, seen in the upgrade menu. A Franchi PA8 with a vent-rib barrel, most of a Franchi SPAS-12 foregrip, a top rail on the receiver, and Benelli-style ghost ring sights appears as the "Tactical Shotgun" and can be bought at the Supply Shack for 140 Byzantine Coins. It can be fitted with all the same upgrades as the Winchester Model 1912, as well as a 12-shot drum magazine for quick reloads. 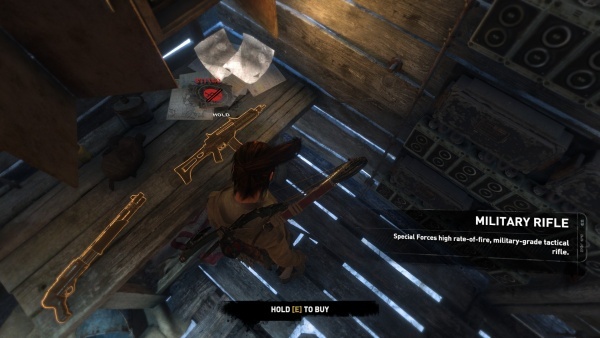 The PA8 in the Supply Shack as Lara checks out the selection. 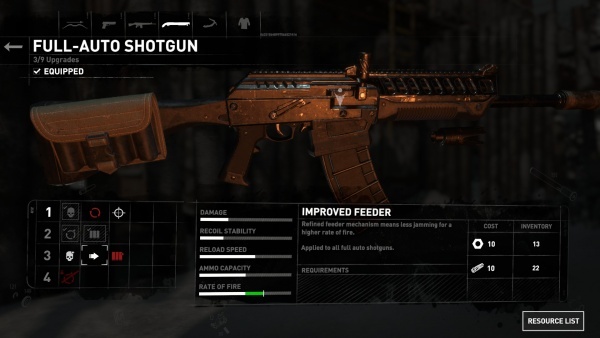 The PA8 in the upgrades menu. Oddly, the magazine tube extension remain in place after fitting the drum mag and two separate muzzle devices are fitted at once. It's worth noting that the drum magazine is a X Products X-15 5.56x45mm 50-round drum magazine meant for AR-15s. 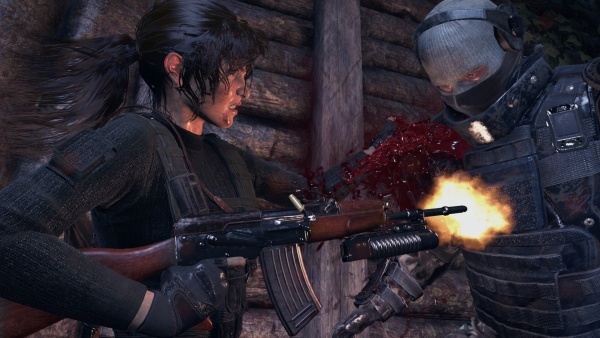 Lara executes a Shotgun Finisher on an unlucky Deathless One with her PA8. 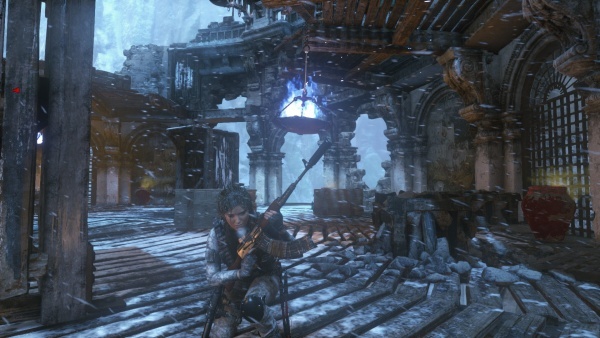 Lara fires her PA8 at a Remnant-fired trebuchet round, hoping to bring down Trinity's mutant helicopter. 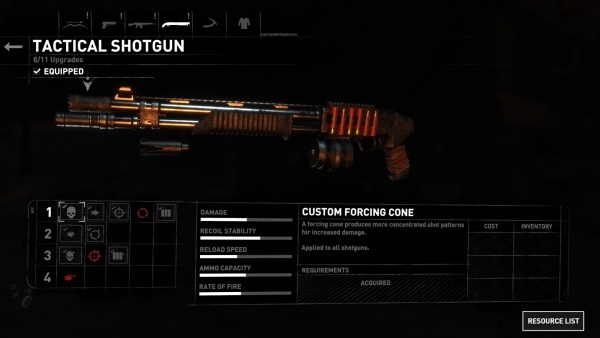 The Izhmash KS-K shotgun appears as the "Full-Auto Shotgun", and it unique version "Harbinger" with a red paint job. It is fitted with a after-market handguard and an enlarged charging handle. The 6-round magazine can be upgraded to a 12-round box magazine and then a 15-round drum. The KS-K seen in the weapon upgrade menu. 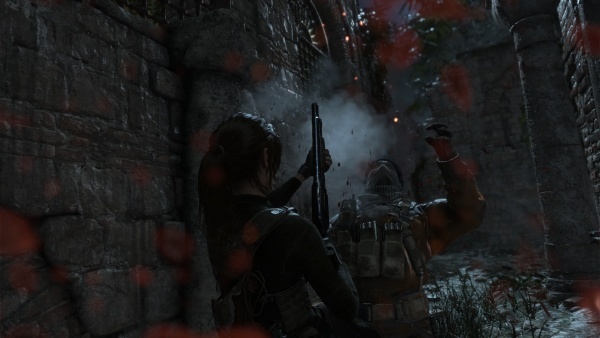 Lara pours buckshot into Trinity Special Forces soldiers hiding in smoke. The skull with a line through it symbol indicates that a Finishing Move can be done on the target. 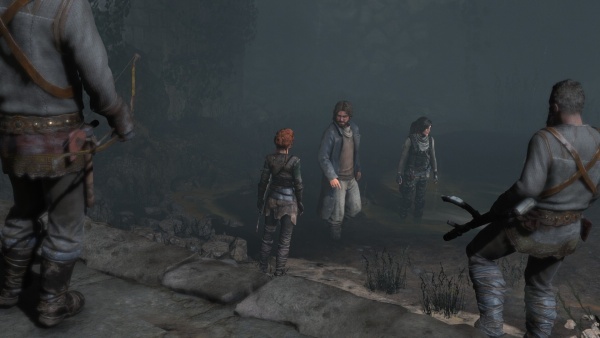 Lara holds Harbinger as she talks with Remnant fighters in a cave. 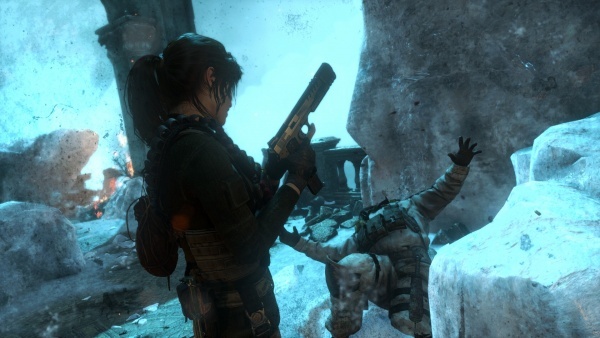 Lara prepares to execute a Shotgun Finisher move with Harbinger. 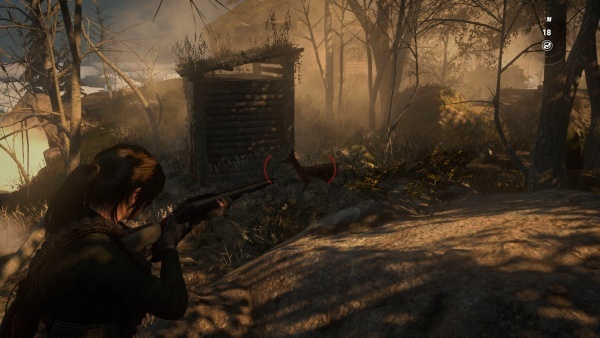 The Remington 700 appears as the "Bolt Action Rifle" in game. There is also a gold variant of it available. The WASR-2 is the standard weapon of all factions, including Trinity and the Remnant. 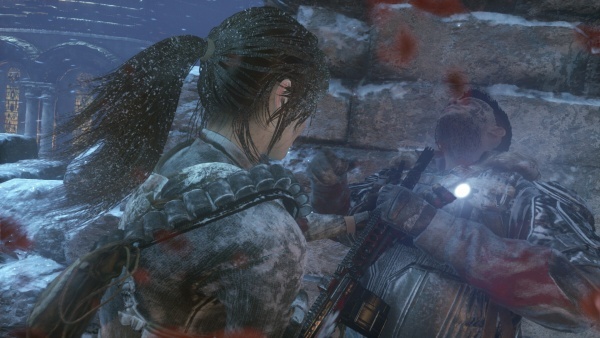 Lara aquires one after disarming a Trinity solder in the Gulag level, and it is avalable the rest of the game. Oddly, the gas tube is not present on the weapon, the game treating it as a Tier 4 upgrade that increases the rate of fire. Trinity soldiers move to secure an objective in Syria. 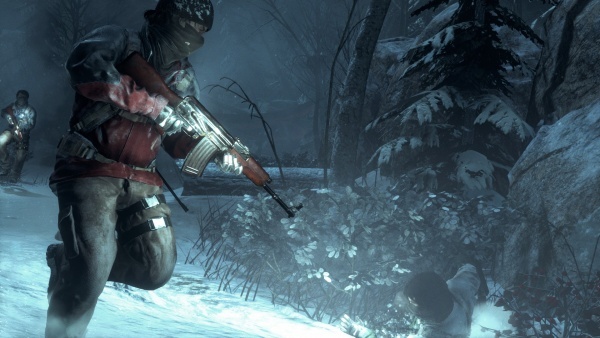 Lara aims her newly acquired WASR at its former owner as she escapes the Gulag. 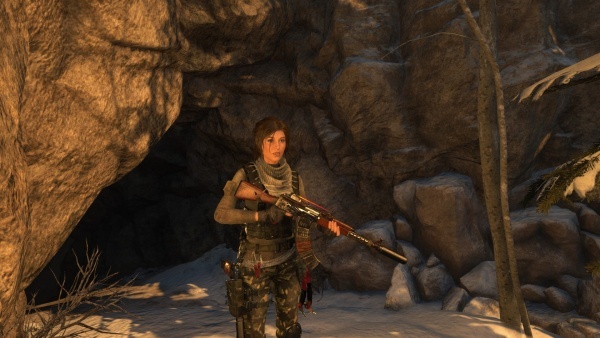 Lara holds her laser-sighted WASR, which also has a AK-74 style muzzle brake. 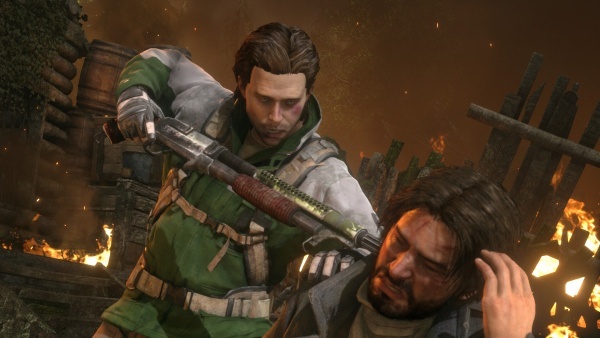 Trinity solders hold Remnant fighters at gunpoint in a cutscene. 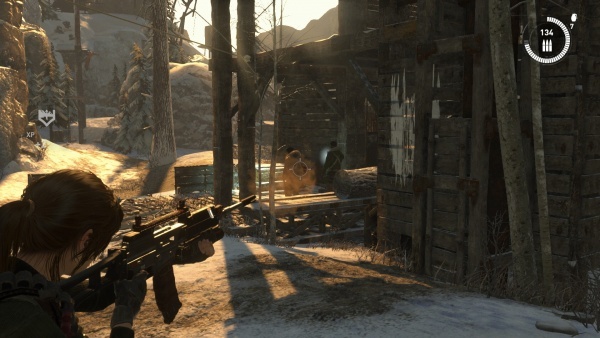 Lara preforms a Assault Rifle takedown with her WASR on a Remnant soldier. Note the triggerless M203A1, and that the front sight seems to have vanished. The WASR-2 can be upgraded with extended 35 and 40 round magazine, an AMD-65 style heat shield, AK-74 style muzzle brake, and an extended barrel, resulting in a mish-mash of various AK-47 derivatives. The end result resembles the Zastava M72. 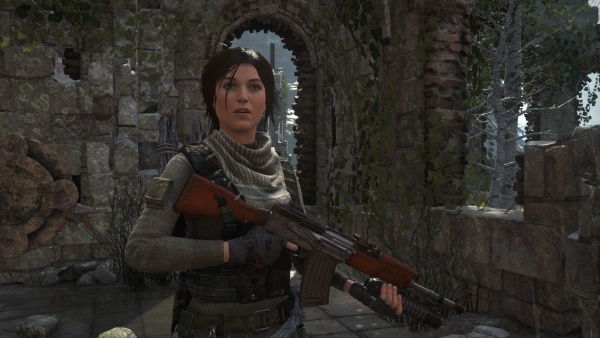 Lara holds her mutant AK. It is fitted with a laser sight, jungle-taped 35-round mags, a heat shield, and suppressor. 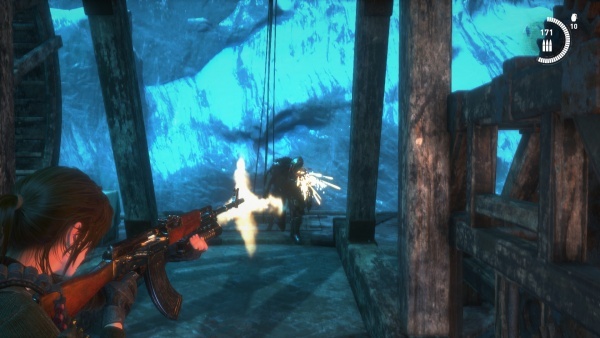 Lara clutches her AK, now fitted with an extended barrel, during the final level. Aiming the AK in the weapons selection screen. 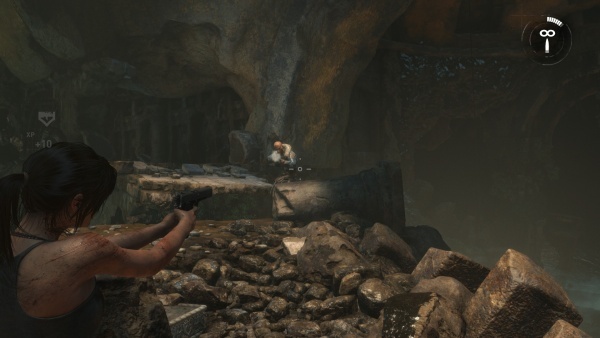 Lara opens fire on a Deathless One in the Lost City. The AK in the upgrades menu. 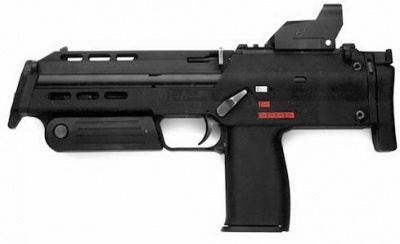 The Heckler & Koch G36K appears as the "Military Rifle" and is used by Trinity Enforcers, often with laser sights. 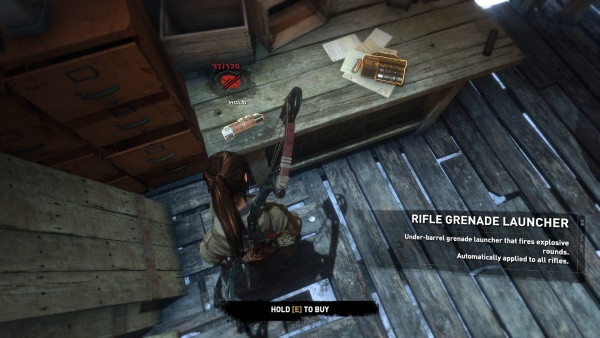 Lara can buy it from the Supply Shack for 140 Byzantine coins. The stock 30-round magzine can be upgraded to a 45-round box magazine and then a 60-round drum. A snow-camo version, Snowflake, is available. The G36K in the Supply Shack as Lara checks out the selection. A Trinity Enforcer operator carries a G36K as he prepares to attack Lara. 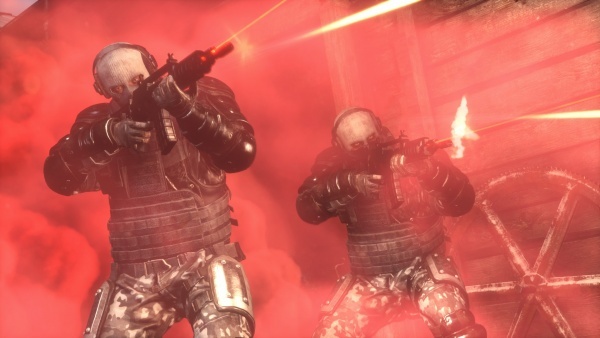 Enforcer operators advance through smoke firing their laser-sighted G36K assault rifles. 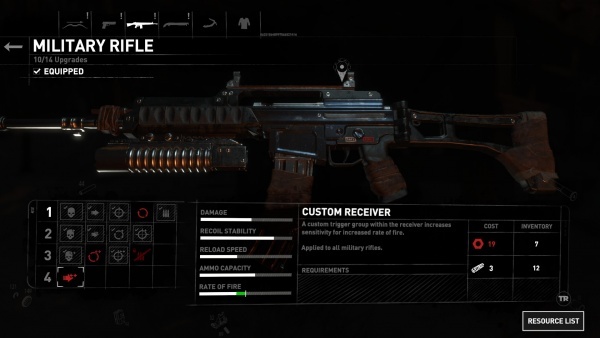 The G36K in the upgrade menu. 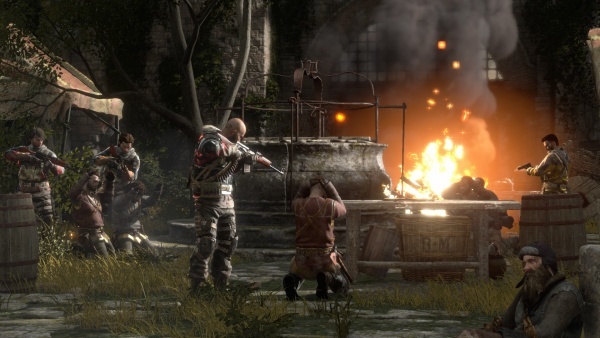 Lara ambushes some Trinity solders at the lumber mill. Note the extended 45-round mag, long barrel, muzzle brake, M203A1, and improved receiver (denoted by its lighter color). 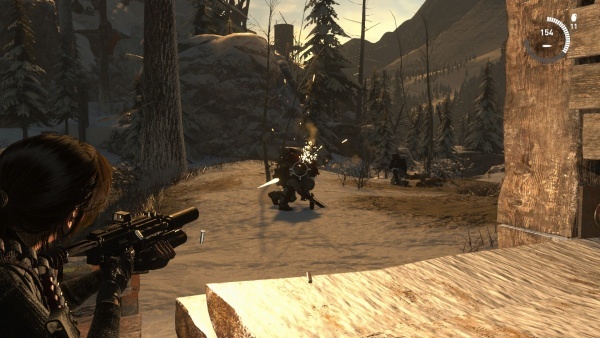 Lara preforms a Assault Rifle Takedown with her G36K, now fitted with a suppressor and drum mag. A Trinity soldier desperately pours G36K fire into a group of Deathless Ones shortly before being obliterated by a Remnant trebuchet strike. 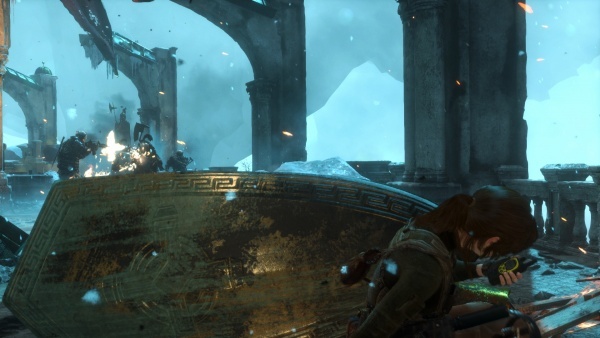 Lara engages Trinity forces with a heavily upgraded Snowflake. Note the X Products X-15 50-round drum magazine. Brass flies as Konstantine sprays G36K fire at Lara in their fight. The M203A1 appears as the "Rifle Grenade Launcher" and is available for 120 Byzantine Coins at the Supply Shack. It seems to be based on a G&P airsoft model due to the simple RIS mount. The trigger guard and trigger are missing on the in-game model despite being visible in the Supply Shack. Fired with MB4, the M203A1 is fitted to all Rifle-category weapons and does not need to be reloaded as long as Lara has ammo for it. 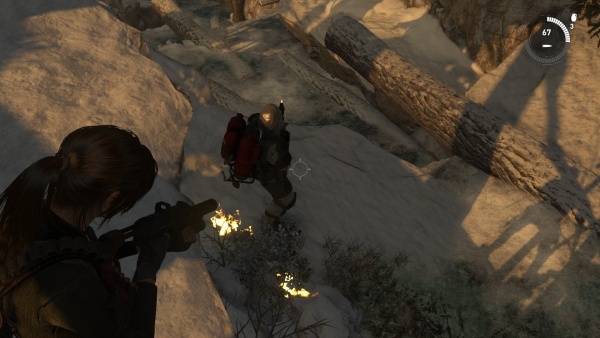 Despite this, trying to fire without ammo will result in Lara attempting to reload. The M203A1 at the supply shack, with the trigger and trigger guard visible. Note the simple RIS attachment point. 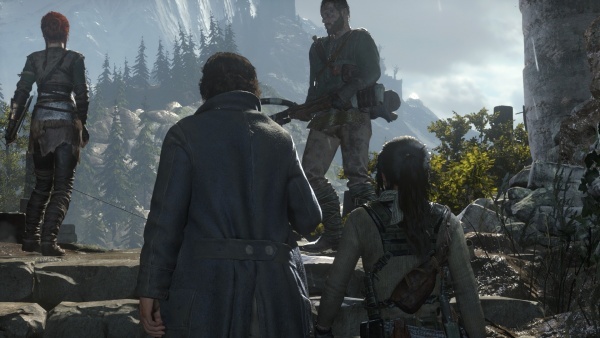 A side view showing the missing trigger and trigger guard as Lara talks to a Remnant teacher. 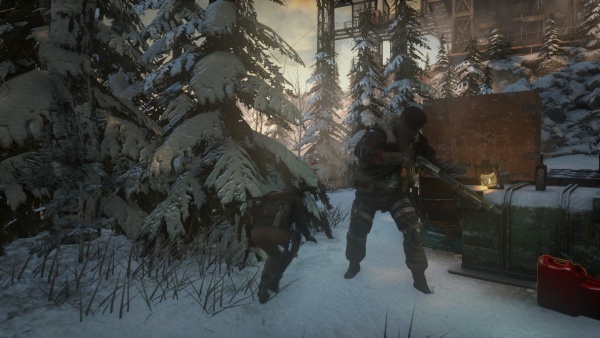 Another view of the M203A1 mounted to Lara's mutant AK in the upgrade menu. 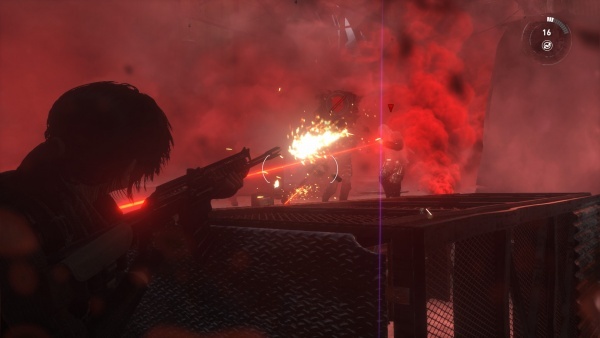 The grenade launcher from the 2013 game returns, mounted on Type 100 submachine guns used by Remnant fighters and Trinity mercenaries in cutscenes. Mounted to all the Type 100 submachine gun in this cutscene. 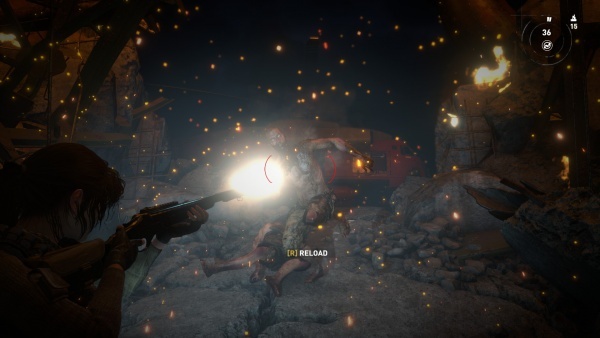 A Firefly advances on Lara in a cutscene. 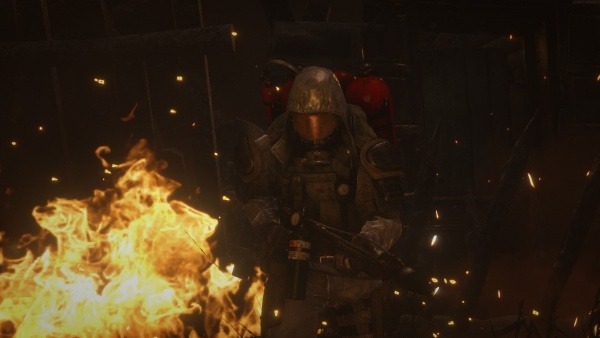 A few rounds later, the operator about to explode in a karmicly appropriate fireball. 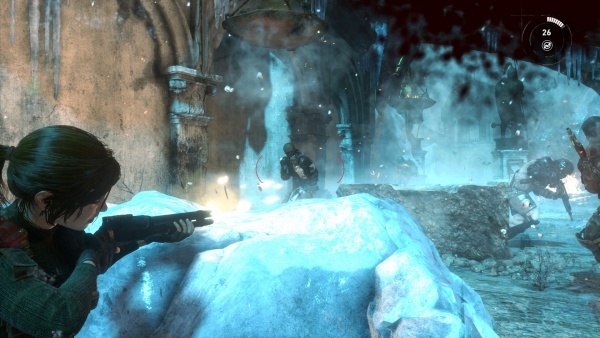 The handheld Type 1 Heavy Machine Gun from the previous game's multiplayer is seen as Lara swims through the Flooded Archives level, dropped by a fallen Trinity soldier. The machine gun sinks to the bottom as Lara swims by. A M67 hand grenade is thrown at Lara in a cutscene. 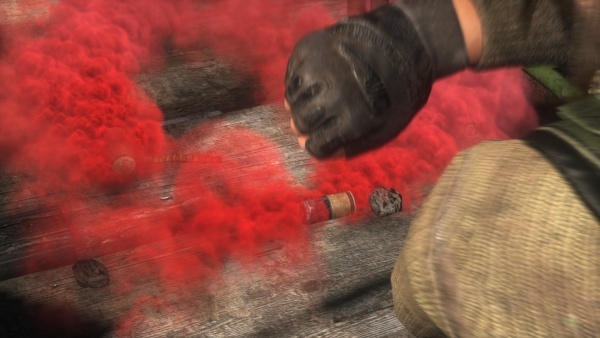 Trinity soldiers throw smoke grenades at Lara in a cutscene. Another view, showing the holes around the top. 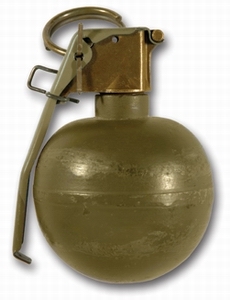 The grenades may be modeled off of airsoft 40x46mm rounds, similar to the round seen in Season 1 of Arrow. 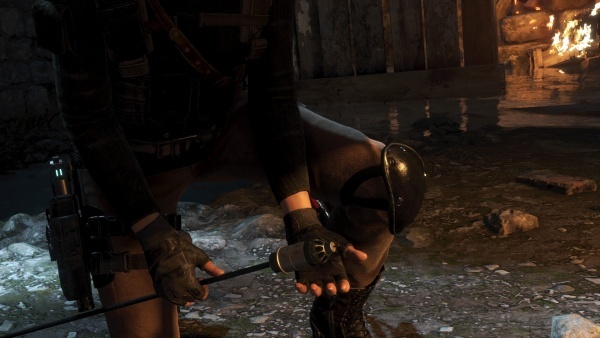 Lara finds what appears to be a modified Airsoft version of a M203 40x46mm round in a Remnant arms cache and uses them to craft Grenade Arrows. 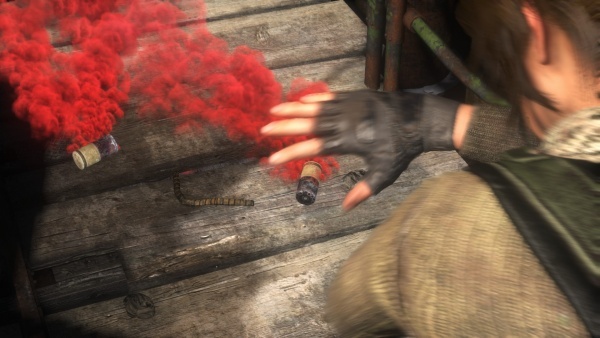 Lara discovers the grenade. Note the holes around the top, used to spray airsoft pellets. The completed first grenade arrow. Note the 1944 date on the round, erroneous as the 40x46mm round debuted in the early 1960s.